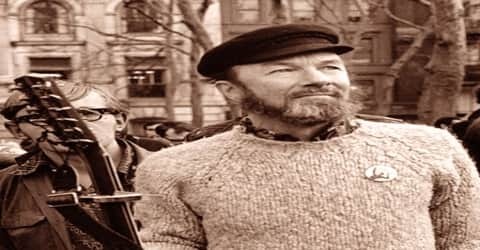 Pete Seeger – American folk singer and social activist. 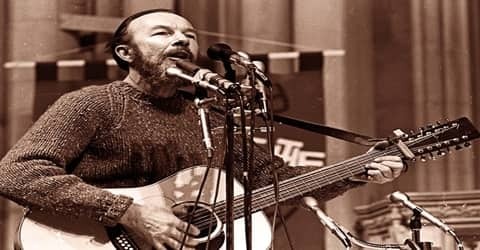 American singer who sustained the folk music tradition and who was one of the principal inspirations for younger performers in the folk revival of the 1960s, Pete Seeger was born on May 3, 1919, at the French Hospital, Midtown Manhattan, U.S. He was not only a singer but also a songwriter, labor activist, naturalist, and peace advocate. A prolific songwriter, his best-known songs include “Where Have All the Flowers Gone?” (with Joe Hickerson), “If I Had a Hammer (The Hammer Song)” (with Lee Hays of the Weavers), and “Turn! Turn! Turn!”, which have been recorded by many artists both in and outside the folk revival movement and are sung throughout the world. “Flowers” was a hit recording for the Kingston Trio (1962); Marlene Dietrich, who recorded it in English, German and French (1962); and Johnny Rivers (1965). “If I Had a Hammer” was a hit for Peter, Paul, and Mary (1962) and Trini Lopez (1963) while the Byrds had a number one hit with “Turn! Turn! Turn!” in 1965. His tireless efforts regarding global concerns such as environmentalism, population growth, and racial equality earned him the respect and friendship of such political heroes as Martin Luther King, Jr., Woody Guthrie, and Cesar Chavez, and the generations of children who first learned to sing and clap to Seeger’s Folkways recordings must number in the millions. Rising above all of Seeger’s political ideals and his passion for authentic folk music was his clear voice and chiming banjo, both of which sang out with a clarity that rang true. However, Seeger quit the group after the other members agreed to perform for a cigarette commercial. Pursuing a solo career in the world of music, he sang and wrote songs pertaining to the civil rights, pressing environmental issues and international disarmament. With the advent of protest music, Seeger’s career was on an upsurge. A highlight of his career was when he popularized the song, ‘We Shall Overcome’, which went on to become a spiritual anthem all over the world and more importantly, during the American Civil Rights Movement, which created a positive impact on his career as an activist and a singer. Considered one of the big-guns of ‘folk’ music, Seeger has received innumerable awards for his countless contributions and he was also a recipient of the distinguished Grammy Awards. 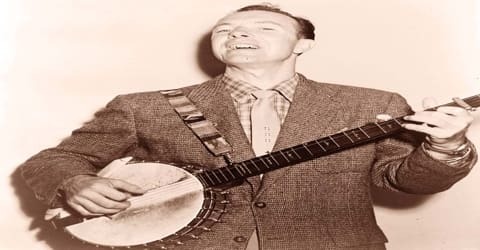 Peter ‘Pete’ Seeger was born on May 3, 1919, to Constance and Charles Seeger, in Manhattan, New York, U.S. He was born to a musically gifted family. His father was the influential musicologist, and his mother was a violin instructor at The Juilliard School. His sister Peggy, too, would go on to become a folk musician and his brother, Mike, became a part of the ‘New Lost City Ramblers’. Seeger was an extremely gifted child and was very well-read, even at a young age. He studied at Avon Old Farms and then attended Harvard University on a scholarship, in 1936. However, after two years, he failed an exam and dropped out of the university. These experiences were the foundation of Seeger’s repertoire of work songs, lullabies, folk songs, and ballads that he would revisit throughout his musical career. In 1935, Pete Seeger attended Camp Rising Sun, an international leadership camp held every summer in upstate New York that influenced his life’s work. He visited it most recently in 2012. In 1943, Pete Seeger married Toshi Aline Ota, whom he credited with being the support that helped make the rest of his life possible. The couple remained married until Toshi’s death in July 2013. Their first child, Peter Ōta Seeger, was born in 1944 and died at six months, while Pete was deployed overseas. Pete never saw him. They went on to have three more children: Daniel (an accomplished photographer and filmmaker), Mika (a potter and muralist), and Tinya (a potter), as well as grandchildren Tao Rodríguez-Seeger (a musician), Cassie (an artist), Kitama Cahill-Jackson (a psychotherapist), Moraya (a marriage and family therapist married to the NFL player Chris DeGeare), Penny, Isabelle, and great-grandchildren Dio and Gabel. Tao, a folk musician in his own right, sings and plays guitar, banjo, and harmonica with the Mammals. Kitama Jackson is a documentary filmmaker who was associate producer of the PBS documentary Pete Seeger: The Power of Song. Pete Seeger was believed to be more spiritual than religious. This famous American folk singer and activist promoted alternative fuel automobiles and owned an electric pick-up truck himself. 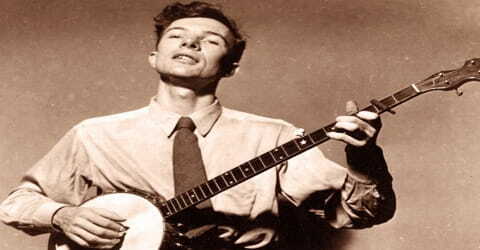 In 1936, at the age of 17, Pete Seeger joined the Young Communist League (YCL), then at the height of its popularity and influence. Leaving Harvard after two years in 1938, Seeger hitchhiked and rode freight trains around the country, gathering country ballads, work songs, and hymns and developing a remarkable virtuosity on the five-string banjo. In 1940, Seeger began focusing on writing music, during which time he organized his first folk group called the ‘Almanac Singers’, along with Millard Lampell and Lee Hays. The group went on to record a number of albums but in 1942, the band stopped making music after he was conscripted into the Army during World War II. After the war ended three years later, he founded the magazine ‘Sing Out!’ and went back to performing folk songs. On March 3, 1940, Seeger met Woody Guthrie at a migrant worker benefit concert, and soon after the two helped form the Almanac Singers, a loosely organized musical collective that included Lee Hays, Millard Lampell, Sis Cunningham, Sonny Terry, Brownie McGhee, Lead Belly, Josh White, Burl Ives, and Richard Dyer-Bennett at different times. The Almanac Singers’ career was brief (lasting just over a year), but their pacifist attitudes and their ability to draw large crowds brought them under the scrutiny of the political powers of the time. Upon the dissolution of the Almanacs, Seeger and Hays formed the Weavers with Ronnie Gilbert and Fred Hellerman, finding universal success with their bright renditions of folk songs and spirituals like “Kisses Sweeter Than Wine,” “Wimoweh,” “Goodnight Irene,” and “On Top of Old Smoky.” Unfortunately, Seeger and Hays’ leftist leanings had long been under the scrutiny of the FBI, and ironically, their straightforward and innocuous performances were drawing disdain from the die-hard leftist press. Seeger served in the U.S. Army in the Pacific. He was trained as an airplane mechanic but was reassigned to entertain the American troops with music. Later, when people asked him what he did in the war, he always answered: “I strummed my banjo.” After returning from service, Seeger and others established People’s Songs, conceived as a nationwide organization with branches on both coasts and designed to “Create, promote and distribute songs of labor and the American People” With Pete Seeger as its director, People’s Songs worked for the 1948 presidential campaign of Roosevelt’s former Secretary of Agriculture and Vice President, Henry A. Wallace, who ran as a third-party candidate on the Progressive Party ticket. Despite having attracted enormous crowds nationwide, however, Wallace won only in New York City and following the election he was excoriated for accepting the help in his campaign of Communists and fellow travelers such as Seeger and singer Paul Robeson. In 1948 Seeger formed another group, the Weavers with Lee Hays, Ronnie Gilbert, and Fred Heller man which achieved considerable success on college campuses, in concert, and on several records. Shortly after the group achieved national fame, however, a great deal of controversy was stirred up concerning Seeger’s previous activities in left-wing and labor politics, and the Weavers suddenly found themselves blacklisted by much of the entertainment industry. In 1949, Seeger worked as a vocal instructor for the liberal City and Country School in Greenwich Village, New York. In 1950, the ‘Almanacs’ were re-formed as ‘The Weavers’. The same year, they began composing a string of major hits that topped major music charts for weeks including, ‘On Top of Old Smokey’ and ‘Goodnight, Irene’. They then released a string of other hits including, ‘Dusty Old Dust’, ‘Kisses Sweeter than Wine’ and ‘Wimoweh’. ‘The Weavers’ career was tersely wrecked in 1953 after they were outlawed. Two years later, they were briefly seen on stage and performed at a sold-out gathering in Carnegie. In 1955 Seeger was brought before the House Un-American Activities Committee and his testimony resulted in his being blacklisted for seven years (and not officially cleared on charges of contempt until 1962). Seeger left the Weavers in 1958 for a solo career just as the seeds of the music they planted were beginning to take root on college campuses and in coffeehouses across the U.S. He spent much of the ’60s in the South, marching in civil rights protests and arranging an old spiritual into what he named “We Shall Overcome,” which has become the anthem of the pursuit for equality worldwide. In 1948, Seeger wrote the first version of his now-classic How to Play the Five-String Banjo, a book that many banjo players credit with starting them off on the instrument. From the late 1950s on, Seeger also accompanied himself on the 12-string guitar, an instrument of Mexican origin that had been associated with Lead Belly, who had styled himself “the King of the 12-String Guitar”. Seeger’s distinctive custom-made guitars had a triangular soundhole. He combined the long scale length (approximately 28″) and capo-to-key techniques that he favored on the banjo with a variant of drop-D (DADGBE) tuning, tuned two whole steps down with very heavy strings, which he played with thumb and finger picks. In 1955, Seeger wrote ‘Where Have All the Flowers Gone?’, which was published in ‘Sing Out!’ magazine. It was later made into a song by Joe Hickerson. This is largely considered the first of his anti-war verses. During the later part of the 1950s, he formed the ‘Kingston Trio’, a spin-off of ‘The Weavers’. They continued to record and release a number of singles such as ‘Turn! Turn! Turn!’ and ‘The Bells of Rhymney’. He was also politically active during the period. After the 1950s Seeger usually worked alone or with his family (Brother Mike was a member of New Lost City Ramblers; Sister Peggy, a singer, and multi-instrumentalist, became one of the driving forces behind the British folk music revival with Ewan McColl, her partner in life and in music making). As a solo performer, he was still a victim of blacklisting, especially after his 1961 conviction for contempt of Congress stemming from his refusal in 1955 to answer questions posed to him by the House Committee on Un-American Activities concerning his political activities. Although Seeger’s conviction was overturned the following year in an appeal, for several years afterward the major networks refused to allow him to make television appearances. In later years the controversy surrounding the performer gradually subsided. In 1962, Seeger put the words to a portion of the book of Ecclesiastes to music, capturing the feel of the changing climate of the youth movement in his song “Turn! Turn! Turn! (To Everything There Is a Season).” In addition to the countless social rallies he organized and participated in at this time, Seeger also had a hand in many of the Newport Folk Festivals in the early and mid-’60s. His adherence to the sanctity of folk music came to a boiling point with the advent of folk-rock, and this was visibly demonstrated when he tried to pull the plug on Bob Dylan’s very electrified set with the Paul Butterfield Blues Band in 1965. In 1966, Seeger recorded the album, ‘Dangerous Songs! ?’, which was more of a ridicule album attacking the-then President Lyndon Johnson, pertaining to the arms race and Vietnam War issue. The following year, he attracted more attention when he wrote a song about the captain who drowned while leading a legion on military exercises during World War II. The name of the song was titled ‘Waist Deep in the Big Muddy’. From 1965 to 1966, he hosted a ‘folk music’ series which was produced on a low budget titled, ‘Rainbow Quest’. On the show, his guests were The Stanley Brothers, June Carter, Johnny Cash, The Beers Family ad Roscoe Holcomb. In 1969, Seeger wrote a song about the Hudson River and performed on it titled ‘That Lonesome Valley’. It was during this time, he was considered a leading figure of the ‘folk’ revival period. At November 15, 1969, Vietnam Moratorium March on Washington, DC, Seeger led 500,000 protesters in singing John Lennon’s song “Give Peace a Chance” as they rallied across from the White House. 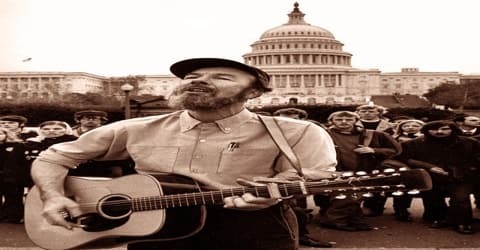 Seeger’s voice carried over the crowd, interspersing phrases like, “Are you listening, Nixon?” between the choruses of protesters singing, “All we are saying … is give peace a chance”. 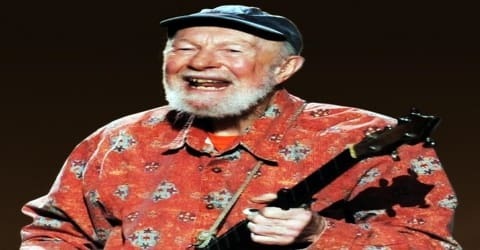 A beloved fixture at folk festivals, Seeger was given major credit for fostering the growth of the hootenanny (a gathering of performers playing and singing for each other, often with audience participation) as a characteristically informal and personal style of entertainment. Among the many songs that he wrote himself or in collaboration with others were “Where to Have All the Flowers Gone,” “If I Had a Hammer,” “Kisses Sweeter Than Wine,” and “Turn, Turn, Turn.” His The Incompleat Folksinger (1972) is a collection of his writings on the history of folk songs, civil rights, and performers in his lifetime. 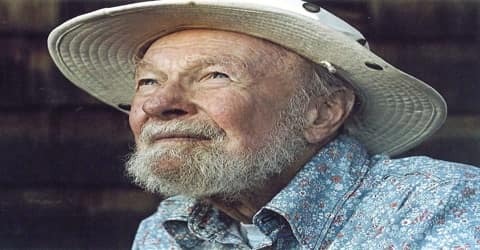 In November 1976, Seeger wrote and recorded the anti-death penalty song “Delbert Tibbs”, about the eponymous death-row inmate, who was later exonerated. Seeger wrote the music and selected the words from poems written by Tibbs. Seeger also supported the Jewish Camping Movement. He came to Surprise Lake Camp in Cold Spring, New York, over the summer many times. He sang and inspired countless campers. In the 1970s and ’80s, Seeger was active in a program to remove pollution from the Hudson River, building the Hudson River Sloop Clearwater, promoting festivals for its maintenance, and engaging in environmental demonstrations, particularly antinuclear ones. During this period Seeger also performed regularly with singer-songwriter Arlo Guthrie, Woody Guthrie’s son. In 1980, Seeger released the album ‘God Bless the Grass’. Throughout the remaining part of the decade, he expressed his condemnation of violent revolutions and also expressed his interest in favor of incremental revolution. In 1982, Seeger performed at a benefit concert for Poland’s Solidarity resistance movement. By the 1990s Seeger had transcended the accusations of the McCarthy era, and he was regarded as a cherished American institution. The motto inscribed on his banjo “This machine surrounds hate and forces it to surrender” seemed to have been proven correct. In 1994 he was awarded a National Medal of Arts, the first of many honors that he received as the century approached its turn. Seeger was inducted into the Rock and Roll Hall of Fame in 1996, and the following year he received his first Grammy Award, for Pete (1996). From 1989 to 1992, Seeger released a string of albums such as, ‘Traditional Christmas Carols’, ‘Folk Songs for Young People’ and ‘American Industrial Ballads’. He wrote his autobiography in 1993 titled, ‘Where Have All the Flowers Gone?’ The same year he released ‘Darling Corey/Goofing-Off Suite’. From 1996 to 2000, he released a string of albums including ‘Pete’, ‘Birds, Beasts, Bugs, and Fishes’, ‘Headlines and Footnotes: A Collection of Topical Songs’ and ‘American Folk, Game and Activity Songs’. From 2002 to 2007, Seeger released a string of ‘American Favorite Ballads’ records from Volume 1 to Volume 5. In 2008 he recorded the award-winning album, ‘At 89’. The next year, he performed at President Barack Obama’s inaugural celebration. In 2008, Seeger released At 89, a collection of newly recorded classics and newly written material. Released on September 30, it won the 2008 Grammy Award for Best Traditional Folk Album. In 2010, at the age of 91, Seeger released ‘Tomorrow’s Children’, which he dedicated to environmental awareness. The album won a Grammy for the best musical album for children in 2011. From 2012 to 2013, he released a number of albums including ‘A More Perfect Union’, ‘Peter Remembers Woody’ and ‘The Storm King- Stories, Narratives, Poems’. He continues to support civil rights, international disarmament, and environmental causes. On September 21, 2013, Pete Seeger performed at Farm Aid at the Saratoga Performing Arts Center in Saratoga Springs, New York. Joined by Wille Nelson, Neil Young, John Mellencamp, and Dave Matthews, he sang “This Land Is Your Land” and included a verse he said he had written specifically for the Farm Aid concert. Seeger’s “musical autobiography” Where Have All the Flowers Gone: A Singer’s Stories, Songs, Seeds, Robberies was published in 1993. Pete Seeger received the ‘Grammy Lifetime Achievement Award’ in 1993 for his outstanding contributions to music. He won a Grammy Award for ‘Best Traditional Folk Album, for ‘Pete’, in 1997. Seeger won a Grammy Award for ‘Best Traditional Album’ in 2008, for ‘At 89’. He was presented the ‘George Peabody Medal’, in 2013 in honor of his exceptional contributions to music in America. 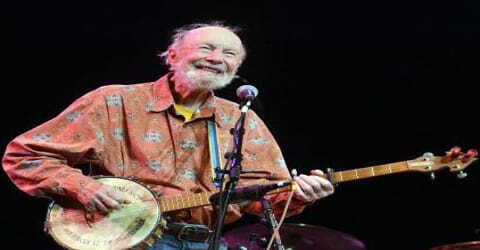 Pete Seeger died at New York-Presbyterian Hospital on January 27, 2014, at the age of 94. He was politically and environmentally active until his last days. His passion for reaching the hearts and minds of those who would listen was summed up by the inscription on his banjo, “This machine surrounds hate and forces it to surrender.” Seeger’s music didn’t force hate to surrender with muscle or intimidation, but with his simple honesty and pure-hearted clarity, which truly changed the course of history during the many years he performed. ‘Where Have All the Flowers Gone?’ is regarded as one of his greatest singles, which he has also written. The song was written in 1955 and was then recorded five years later. It is currently listed as one of the ‘Top 20 Political Songs’ with a message.